Aside from the side–pass, lateral movements were primarily designed as exercises to help develop the hindquarters of the horse. 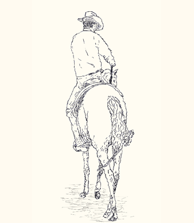 Strong supple hindquarters assist a horse in both movement and carrying the additional weight of a rider by allow the horse to reposition it center of gravity more towards the rear [see section on balance]. A horse with strong supple hindquarters can better travel forward with a straight body rather than avoiding effort by carrying its hindquarters to the side as is often seen when horse's are cantering [see section on cantering]. Feeling a horse's response and adjusting the cues accordingly produces better movement than does force. 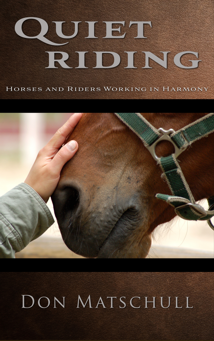 A horse can sense a rider's responses better and respond more quickly and smoothly when relaxed. See the section on Other Considerations for more information on this topic. 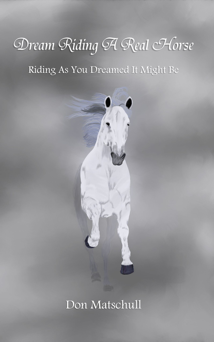 As with all exercises programs a rider should begin with lesser demands and progress to more difficult work only when the horse has been properly prepared. Careful progressive work may appear to take longer at first but generally produces the best results in the shortest time. Trying to rush the process usually results in stress injuries that take time to heal, delaying overall progress. Proper benefit of the lateral movements is derived from precision in their execution. Repeated work with bad form is of little value. Work on lateral movements usually begins with the leg-yield. The leg-yield is the easiest of the lateral movements for a horse to perform since it puts the least stress on the muscles of the horse. In the leg-yield, the horse's body is basically straight though there is a slight bend of the head at the poll away from the direction of travel. The horse is asked to move sideways at the same time it is moving forward. The purpose of all lateral movements is to get the horse stepping further beneath its body with one of its hind feet — generally the inside hind. By stepping further towards the horse's center of gravity, the leg begins to support more of the horse's weight. Also, in order to do this, the horse must begin to stretch more with the muscles of this leg and his hindquarters in general. The shoulder–fore asks more of this than the leg–yield. In the shoulder–fore, the horse's body is bent slightly as in a turn rather than being straight with just a bend of the head at the poll. The horse's feet make four tracks when performing the shoulder–four. If working along the side of an arena, the order of the feet from inside out are the inside fore, inside hind, outside fore, and outside hind. At least since the eighteenth century, the shoulder–in has played the dominant role in the development of the horse's hindquarters. The shoulder–in calls for more of a bend throughout the body of the horse than the shoulder-fore. Today, the shoulder–in is generally considered a three-–track movement. The inside fore makes the first track. The second track is made by the outside fore with the inside hind following directly in its path. The third track is made by the outside hind. Historically, this three–track movement was called the "semi–shoulder–in". The original shoulder–in was performed on four tracks in the following order: inside fore, inside hind, outside fore, outside hind. The four–track shoulder–in is more demanding and better develops the strength and suppleness of the horse's hindquarters. The shoulder–in may be called the right shoulder–in or the left shoulder–in depending on which of the front shoulder takes in innermost track. There is no "shoulder–out". If the horse is bent to the outside of the arena when travel in a clockwise direction, the movement would be a left shoulder–in. In the haunches–in (quarters–in or travers), the horse's body takes on much the same bend as when performing the shoulder–in. However, the horse is bent in the opposite direction. Consequently, it is the horse's outside hind leg that is asked to step beneath the horse's body towards its center of gravity. The haunches–in may be performed as a three or four track movement. The deliberately performed haunches–in should not be confused with the movement of a horse cantering with its hindquarters bent to the inside as a form of evasion. However, many riders avoid work on the haunches in fearing it might encourage such evasion. Unlike the shoulder–in, the haunches–in has a counter movement referred to as the haunches–out (quarters–out, tail to the wall, or renvers). In this movement, the horse's forehand is brought in from the side of the arena and the haunches are bent to the outside. The positioning of the horse's body when performing the half–pass is similar to that of a horse performing a haunches–out with a bend throughout the body as if traveling on a circle. The half–pass is performed with the horse traveling diagonally across the arena. The alignment of the horse's hips is basically perpendicular to the side of the arena, while the shoulders are angle more towards the side. The shoulder proceed the haunches in the direction of travel. The side–pass (also referred to as the full–pass) was designed as a method to adjust the spacing of cavalry horses lined up abreast of one another. Today, the movement is more commonly seen in trail competition and as part of the movement when opening gates from horseback. When performing the side–pass, the horse should be bent slightly in the direction of movement. The horse's outside legs should step in front of its inside legs. The term "opening the door" is commonly used to describe the action of a rider in drawing his leg away from the horse's side in order to encourage the horse to move in that direction. This action is usually used in combination with the rider's other leg applying pressure or spurring the horse's opposite side. The following four images illustrate what can happen when a rider exaggerates the movements used when "opening the door". The rider is relieving the pressure of his right leg while he applies pressure with his left leg and left spur but seems unaware of what his other movements are causing his horse to do. Notice in the first drawing how the rider has shifted his seat to the left of center on the horse's back. This is sometimes done on purpose. 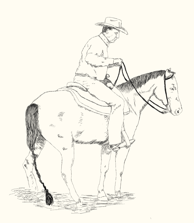 It is often simply the result of drawing the one leg too far from the side of the horse and trying to maintain balance on the horse's back. 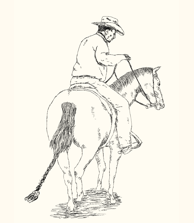 The second drawing gives an idea of how far the rider has moved his right leg away from his horse. In the third drawing, we begin to see a problem in how the horse is moving. The rider was attempting to get the horse to move his front feet to the right. Notice, however, that the horse seems to be anchored on his left hind foot rather than his right. This is because the greater portion of the rider's weight has been thrown upon the left side of the horse. The fourth drawing shows what has happened a couple of steps later. Though his tactics do get the horse to move its front end to the right, the rider seems unaware of what else is happening. When his weight shifts to his right hind foot, the horse steps over with his left front, but – because the horse is off balance – his left front foot steps behind rather than in front of his right front foot. Whether simply turning, turning on the haunches, or performing a pivot, the outside foot (that on the convex side of the horse) should always step in front of the inside foot. Notice, also, how the horse has lost its balance so badly that it must take a large step outward and backward with its left hind foot in order to catch both its weight and the weight of the rider. 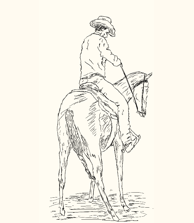 Moving one's leg one–eighth of an inch from the side of a horse "opens the door" just as effectively as moving it several inches from the horse's side without the ill effects caused by the rider shifting his center of gravity and causing the horse to move its rear in the opposite direction to keep the rider from falling off. By moving his leg as little as possible to open the door, the rider is able to stay better centered over his horse and use subtle and controlled shifts of weight to get his horse to turn around its inside hind foot. A rider who is better aware of his body and that of his horse is better able to apply the subtle changes that can bring about significant responses in his horse while, at the same time, avoiding other actions that can cause undesired consequences.